Email is a magical thing. I emailed my best friend all the way in New Zealand yesterday and had a response from him almost instantly. I still print my favourite emails out and keep them safe in a box. Sometimes, words on a screen still aren't the same as words on paper. 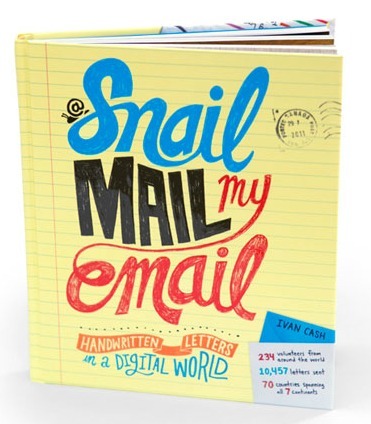 Snail Mail my Email was created by artist Ivan Cash in 2011. It's exactly what it sounds like: thousands of emails have been sent via snail mail but they've had a bit of artistic interpretation first. The project has now seen 431 volunteer artists send 13,968 artistically-interpreted letters across the world. Some of the results of the project are available to see on the website (these are lovely) and a Snail Mail my Email book has been released. Not only do you get to look at some gorgeous artwork, you get to have a little bit of a snoop into people's emails. Snooping in emails shouldn't be fun, but it really really is. The project is aiming for a new edition next year, but in the meantime, let's soak up the lovely snail mailed emails in Ivan's book. I might even get my crayons out and send a letter to New Zealand instead of an email. Give Izola's drink-related presents and be merry!